Wandering Jew, from Eugene Sue's novel, written by Leopold Lewis (author of The Bells). Scene 1: The Arctic regions. Howard Russell played the Wandering Jew. SCENE FROM THE "WANDERING JEW." Mr. Leopold Lewis has shown himself the successful manipulator of old subjects in the spectacle, which may now be witnessed at the Adelphi under the above title. We give an engraving of one of the scenes, which though, in the first act, is one of the most effective in the drama. 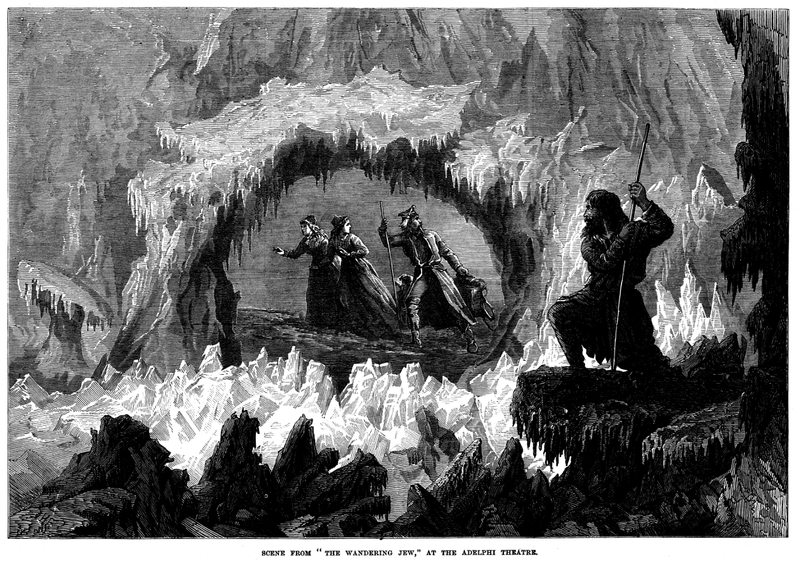 It shows the supernatural experience of the Wandering Jew in the Arctic regions, where he gazes on the various tableaux which prefigure the fortunes of his race and offspring. Mr. F. Lloyds probably never built up anything in its way more effective. The play throughout is very mysterious in its colouring, and it would be difficult to present a very intelligible account of the situations as they arise. Plays of this kind require the aid of the original romance to their full interpretation. An immense amount of story is here concentrated into a few scenes, and the audience apparently accept in them a satisfactory epitome of the book.